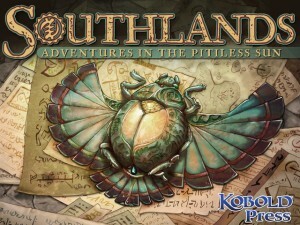 Kobold Press is running a Kickstarter campaign for Southlands: Adventures in the Pitiless Sun, a new Pathfinder-compatible RPG book. They're more than 2x funded, so it's stretch goals ahoy for 28 days. The Southlands takes you to the great empires and wealthy kingdoms of the hotter climates, drawing on a range of fantasy traditions from the Arabian Nights, to Egyptian mythology, to the tales of King Solomon's Mines and Prester John. Imagine the Scorpion King, Conan, and Sindbad joining forces to find a lost treasure, and fighting dinosaurs, great white apes and were-hyenas along the way—plus djinn, ifrit, and snake-headed, six-armed demon lords. Players will find many new character options for Pathfinder RPG. GMs will find kingdoms, treasures, monsters and adventure hooks for desert, jungle, and tropical mountain adventures. There’s also a dollop of esoteric lore for those who seek the type of knowledge only found within the most ancient papyrus scrolls.